Epsom salt is a commonly used home remedy. These salts, named after the town of Epsom, England, consist of the minerals magnesium and sulfate. Soaking feet or joints in warm water mixed with Epsom salt is touted to soothe joint pain, and also to treat swollen feet and ankles, sore muscles, arthritis and skin disorders. While there is limited research on the benefits or mechanism of action of this home remedy, soaking your feet in Epsom salt may improve your symptoms. However, not all swelling is improved by heat or foot soaks, so persistent swelling needs to be evaluated by a doctor. Add Epsom salt to warm water. Use one-half cup of this salt in a plastic basin large enough to hold your feet, or use 1 to 2 cups Epsom salt if using your bathtub. Wait 2 to 3 minutes for the Epsom salt to dissolve. If the salts are not dissolving, stir the water with your hands or add warmer water. Place your affected foot, or both feet if preferred, into the plastic basin or bathtub. Make sure your swollen ankle is completely covered by the water and salt. Soak for at least 20 minutes, then pat your feet dry. Soak once a day until your ankle is no longer swollen. Add lotion to your feet afterwards, if preferred, if you notice your skin dries out from the salt soaks. Soaking feet in an Epsom salt bath can offer some benefits. It can reduce foot odor and soften the skin. Warm or hot water can help healing because it improves blood flow to the skin. 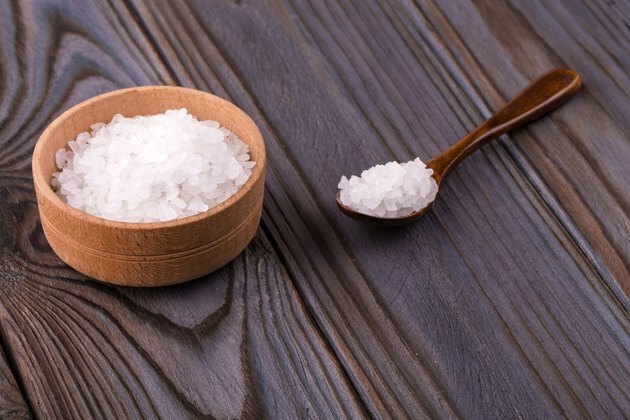 Epsom salt soaks may also inhibit bacterial growth, reducing the risk of skin infections. Also, warm water soaks can be a great way to relax your feet or your whole body, and make you feel better. However, there are some reasons why Epsom salt soaks may not help a swollen ankle. If a swollen ankle is related to an injury, icing your ankle or soaking it in cold water is a better way to minimize injury-related swelling. Warm or hot water may not improve swelling at all, according a November 2006 article published in "American Family Physician." Fluid retention in the feet or ankles may be caused by medical conditions such as liver, kidney or heart disease, and managing these conditions is the most effective strategy to reduce swelling. Certain medications can also cause swollen feet and ankles, and if this occurs, the prescribing physician needs to be notified. However, if the swelling is related to poor circulation, or poor blood flow, foot soaks might help since warm water improves circulation. If your swollen ankle is the result of a serious injury, or if you have persistent foot swelling, talk to your doctor before starting Epsom salt foot soaks. Also, see your doctor right away if you have poor blood flow, nerve disease or diabetes and have foot sores, swelling or pain.